FAQ About Coupons: What If The Store Refuses My Printable Coupons? You are here: Home / Finance / Couponing / FAQ About Coupons: What If The Store Refuses My Printable Coupons? 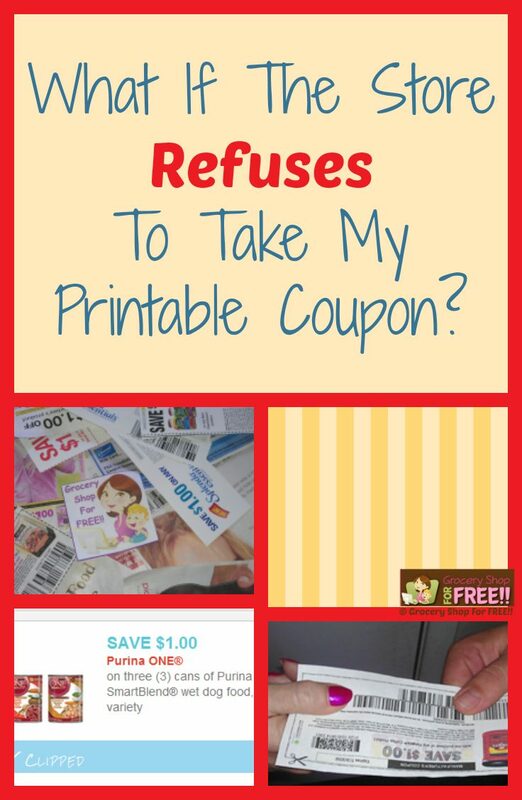 This is a good question, I have heard many of you say that sometimes stores won’t take your printable coupons. Today, I had a fun lunch with Melissa of Melissa Stuff, Courtney of My Crazy Savings, Jasmine of DEALicious Finds, my hubby of Grocery Shop For FREE At The Mart and Jennifer of Wholly Guacamole! This was a topic of conversation at lunch today and Jennifer said that her company will call the store if they find out that a store that sells their product won’t take their printable coupon for it. So, I would suggest you call the manufacturer instead of fighting the store. Let the manufacturer handle it, they pay to have their coupons made for you to print and use and the stores they sell to sometimes won’t take them well, then they need to know! Talk to the —> Cashier —>Manager —> Corporate —> Manufacturer in that order and hopefully somewhere along the chain you can get them to take the printables! Good luck! What kind of experiences have you had with printable coupons at your stores? FAQ About Coupons: 1 Per Purchase Or Transaction? FAQ About Coupons: How Many Do I Have To Buy? FAQ About Coupons: Can I Use A BOGO Coupon & A Cents Off Together? FAQ About Coupons: Where Can I Find Coupons? I print coupons all the time and even alot on Walmarts site,at the bottom of page is a place that says coupons..But lately Walmart will not take a coupon if it wont scan,they wont even try to type in code,they just wont take it,I tried to get them to but they say it is their new policy,since there are so many fake coupons,so i never know if im wasting my ink to print coupons only to get to the check out and find out they wont take it if it dont scan,it is very up setting…. That is their policy and it is upsetting. I am not sure if there is another way around it unless you call the manufacturer and ask why they won’t scan. HA! Feel free to use it! Their theory is if you use Savings Catcher you don’t need to price match – they do it all for you. Are you familiar with Savings Catcher? Most major retailers want to take your coupons. I have worked in retail drug for over 30 years. Every now and then you have some knuckle head who wants to be nasty because they are lazy, but trust me, they don’t last long because the the #1 priority is, in my store anyway, customer service. Happy customers come back. The biggest reason a coupon would be denied is usually either the expiration day, quantity not met, or the coupon it’s self it not legible. If it won’t scan or the numbers can not be read to manually punch into the computer this causes a problem when reconciling the register at the end of the day. The way to avoid this is to be sure your printer ink is full enough to make a legible copy that is readable and not smeared. My manager will take them anyway most of the time even if they won’t scan or the NDC can’t be read, if it is clear what the product is and the amount is legible. Retailer want the sales even if it is free because it shows up on their bottom line as sales and that is what determines their operating budget. More sales, more employees to do the work. Just a thought from a couponer who is also a cashier. Dollar. Tree will not take my. Coupons. Because they have no bar code. Must have bar code & exp. date. Where do I find those? I would need to see your coupons to know why they don’t have a barcode. Where are you getting them? I am sorry for some reason I wasn’t notified of your message here. In cases like these I consult the corporate policy on their website and if I see nothing has changed and there is no note of a “new” policy that includes the issue, then I call corporate and generally they will contact the store and set them straight on the policy.